You’re using the wrong 4D preset, and/or preset that is not optimized. You need to work with your machine and find the best settings possible. Your gain is too high. A fuzzy image often means your gain is too high and image artifact is blocking the face. Your gain is too low. A dark, fuzzy image often indicates that your gain is too low and the ultrasound won’t display the details. Mom is overweight. See “difficult to image patients” later in this article. You have a bad imaging angle but don’t know it. You’re relying on the axis controls too much (X, Y, and Z) and the machine is unable to render a clear image. You’ve got the probe in the middle of the belly and the probe is too far from the face. More often than not, you’ll want to position the probe near mom’s pelvic bone with the probe angled toward the cervix (for vertex baby position). The placenta is in the way. 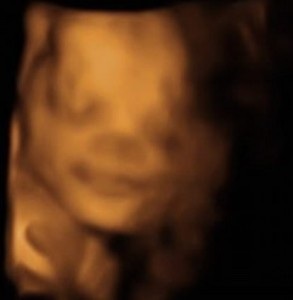 The placenta on or above the face results in a “grainy” or “fuzzy” image and you simply can’t get a good image. Do your best to move the horizontal line in the ROI box between the placenta and face as best you can. The White Line in the 4D image represents the small slice that you see in the 2D Image. Most often, this occurs because obstructions are not showing in the 2D image. This happens because the 2D image only shows a thin slice of the baby’s face. The 4D renders the entire surface of the face. I understand this may be a difficult concept to understand, but there’s no great way to explain it without formal 4D ultrasound training. ​Try looking at the image on the right. It shows 2D image side-by-side with the 4D image. The line down the middle of the 4D image represents the thin slice you see in 2D. Anything to the left or right of that white line is not seen in the 2D image. To see if there are obstructions, in 2D you should sweep the probe left-to-right to see if there are any other obstructions in front of the face, such as hands, placenta, arms, etc. By doing this, you’re mimicking 4D operation and seeing the multiple “slices”. Another situation when this occurs is that you’re not holding the probe steady and it’s sliding across the mom’s belly… thereby losing your image. Try using your pinky to anchor your hand on mom’s belly. Simple repositioning and changing angles often do not provide a solution. Some techs give mom juice or something sweet to get the baby more active. But some babies simply do not want to move. Make this challenge an opportunity and increase the size of your ROI box. Go back to 2D, press the 4D button and reposition the ROI box to a spot above the appendages that are in the way. With this technique, you can show the baby’s face with that foot or hand as part of the picture. This can often be a great picture, particularly if the baby is sucking on a toe or thumb. “Difficult” is usually synonymous with “obese”. This is a matter of physics and not necessarily your talent. The problem is something called attenuation. As the ultrasound waves travel through the body, the sound is absorbed by the body and image quality degrades. 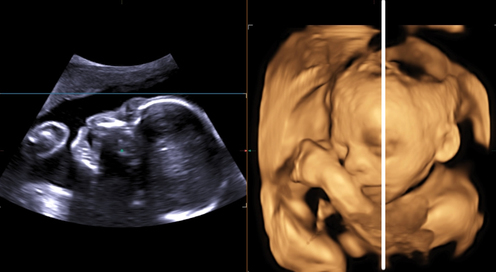 Newer ultrasound machines penetrate the body better, but no ultrasound can defy the laws of physics.Solutions: Try different 2D imaging presets. If there is a “penetration” setting, use this. If not, turn off your Tissue Harmonics and adjust your gain accordingly. Beyond that, you will need to reposition the mom on her side or otherwise to get the probe as close to the baby as possible. This is among the most difficult situations and often there is no fix. You can try a few things: give mom something sweet, such as juice, and give it a little while to see if the baby becomes more active. Also, be sure to use the entire belly to try and get an angle where you can at least get the baby’s profile. Welcome to the club. You won’t always get a full face in the 4D image. You need a lot of perfect things to happen, and the baby simply doesn’t always cooperate with your desires. Try the standard techniques of giving mum something sweet, trying different probe angles, and repositioning mom on her left- and right-sides. This is another very tough situation. If you can’t get the ROI box’s horizontal line between the face and the placenta, try using gravity. Often if you roll mom on her side, sometimes the baby’s face will pull away from the placenta just enough to get a good shot. Otherwise, turn the gain down as much as you can without making the eyes too dark. Turning the gain down will remove more placenta from the image than it will the face. Your gain is too low. Increase the gain. If the baby’s face is far from the probe and there are obstructions, sometimes you can’t get around this look. Just try to slowly increase the gain until you can get the eyes to appear a little bit.